Has anyone made, or knows anyone who has made, a Goban out of Quilted Mahogany? And would it be a good wood to make a Goban? Any suggestions would be appreciated, thank you. If you like it then it is a good wood for a goban. Yellow woods (e.g. Kaya) are popular for Gobans. 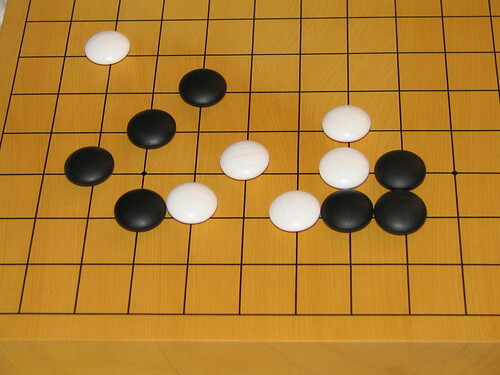 Yellow provides good contrast against both black and white stones on the board. Katsura and agathis which are shades of brown are popular as less expensive alternatives. I agree that technically, Mahogany suits preciously. Nevertheless, it`s one of the least woods I`d like my goban to be made from. International Mahogany trade is banned for a reason. Wherever obtained, the money you spend will contribute to further destruction of rainforests - not just "possibly" but very, very likely. See e. g. this report to get an impression of what`s going on there. So, I`d think more than twice. There are alternatives, including, but not restricted to, the timbers mentioned by jonathan . If you`re living in the U. S. or Europe, then Cherry, Plum, Pear, Apple (in fact, most fruit trees) will do really well, Robinia (locust) or even douglas fir can also be considered. True Kaya (Torreya nucifera) is severely overexploited, too. It doesn`t play such a key role in spoiling an entire ecosystem though, as has Mahogany througout 450 years of tropical logging. Is this true kaya or one of the kaya substitutes? I was told it was real kaya when I bought it years ago. Can you tell kaya from it's substitutes by looking at it? If yes, please enlighten me. What ever wood this is it is a beautiful color. This board is twenty some odd years old and has taken a few knocks over the years. I think the Ing board that have a smooth lacquered yellow finish look very nice and they are very affordable too. this image doesn't do the board justice, they actually look very nice in person. So another option is to choose an inexpensive wood and then give it a very nice painted finish. This approach provides the best bang for the buck. Beside the mere look, there is one point to verify easily by yourself: kaya wood has a peculiar balsamic odor. The fragrance may have softened over time, so try the downside and rub a little there with a sheet of cotton. If it doesn`t scent at all, then I`d examine the board closer ... In that case, rather than being made from a substitute, it may still be true kaya that is just coated heavily though. This discussion seems valuable enough to be moved nearer to Material Goban. so, is everyone saying that it is a bad wood to use?...or, no. I have the wood already, i don't have to go and buy it. I was just wondering if it was a good wood for a Goban. I appreciate everyone's help very much, I thank you all. I do, also know, that Quilted Mahogany "supposidly" is one of the rarest woods out there...not many trees are found of Quilted Mahogany anymore...which would be one reason why i think it would be amazing to make a Goban out of it. I don't know what quilted mahogany looks like. 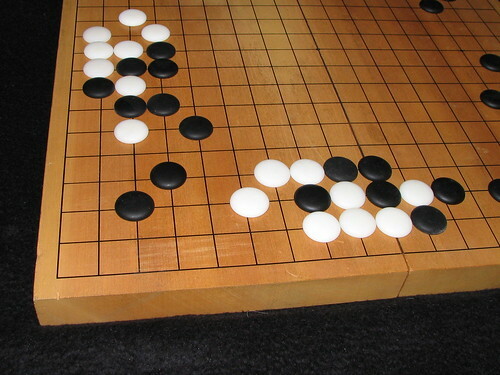 If it is too dark then the contrast between the black stones and the board is poor.